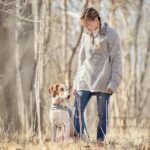 HOLIDAY GIFT GUIDE: For Our Outdoor Enthusiasts! This gift guide is all about the people we love who are crazy about the great outdoors—the people who get out and move in every season and in every kind of weather! Whether you’re shopping for an extreme winter athlete or someone just dipping his or her toes into yoga, there is something here for everyone on your list! 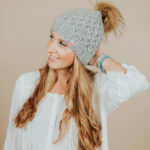 A 100% merino wool hat with faux fur pom pom, designed in Boston and made with a team of female artisans in Peru! 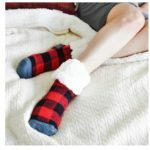 Pudus Slipper Socks are made with the softest, fluffiest most comfortable lining that is guaranteed to wrap your precious feet in warmth and comfort all day and night. Plus, these socks are one of “Oprah’s Favorite Things”! Available at BARE Waxing Boutique. 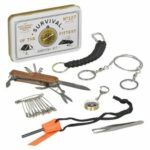 Let the adventure begin with Bell Farm Shop’s Handy Survival Kit that includes everything from a compass and fire starter, to tweezers, and a wire saw! 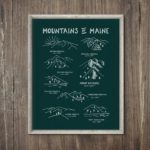 Our “Mountains of Maine” screenprint features eight of Maine’s mountains ranging from Katahdin to Tumbledown Mountain. Hang it in your home and plan your next hike! Available in a 11×14″ print and 18×24″ poster from Hills & Trails. 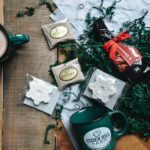 Send a piece of the holiday season to loved ones near and far with Cider Hill Farm’s “Warm & Cozy Box” packed with locally-made hot cocoa, handcrafted snowflake marshmallows, two Cider Hill Farm campfire mugs, and one package of Hammond’s Candy peppermint pillows! These cozy pullovers are perfect for toasty mornings by the fire! Available in various colors for men and women at Inside Out. Oh hello snow day! 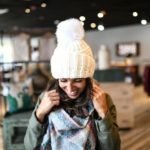 When Jack Frost comes for a visit or there are flurries in the air, bundle up in style with this cozy pom pom hat and plaid scarf combo from Muse Boutique! 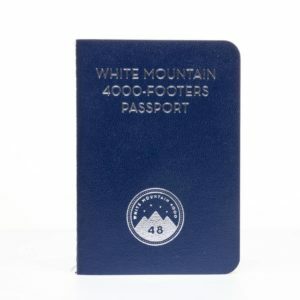 The pocket-size “White Mountain 4,000-Footer Passport” booklet is tailor-made for keeping track of your 4000-footer climbs! A small trinket that is perfect for any New Hampshirite or hiking enthusiast! Available at Gus & Ruby Letterpress. 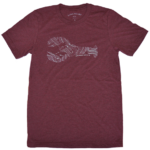 Printed with topographic contours that mirror some of our favorite local fishing grounds, Long Wharf Supply Co.’s Lobster Tee is made from an incredibly soft ringspun triblend. 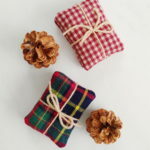 Slip these hand-made flannel Pocket Toasties into your pockets as you head outdoors for a winter walk or snowy activity! Reheat and use again and again—your hands will thank you! 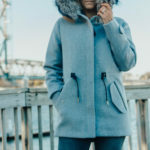 This eskimo coat from Linda Taylor Boutique will keep you comfy, cozy, and stylish all winter long! We’re big fans of the fur hood:). 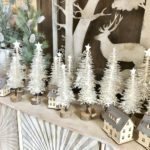 Bring the outdoors in with these sweet ivory Laser-Cut Paper Trees from Weekender House! 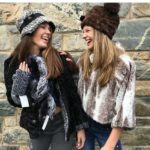 Pandemonium hats, gloves and scarves from Tugboat Alley are extremely soft and stylish with their cuddly faux fur! Designed and made in the USA. 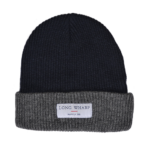 Long Wharf Supply Co.’s Gloucester Wool Cap is knit from 100% soft merino wool and is sure to keep you warm all winter long! Igneous Jewelry’s locally-made stone jewelry is designed with Seacoast beach stones and full diamonds. 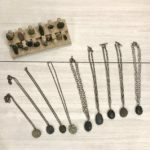 With many available options for finishes, Hazel Boutique will create custom rings and necklaces with stones of your choosing! 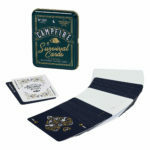 Campfire “Survival” playing cards add a little outdoors-y fun to your favorite card game, and they’re waterproof! Available at Daytrip Society. 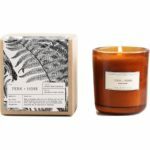 Bring the outdoors in with a natural-smelling “Moss + Fern” candle from Flower Kiosk!